Manuscripts should be written in accordance with the guidelines below. Main text should be prepared in a standard PC-compatible word processing program (e.g., Microsoft Word). Original research articles, reviews, short communications, technical reports and letters to the editor have no maximum page limit. The articles should have more than 7 pages in journal layout; otherwise they may be regarded as short article by the editorial board. Format for initial submission is different than the final one and given below for easier submission of authors. Manuscripts should be typed in Times New Roman font with 12 pt and double line spacing. The page size is A4. Gaps from sides are all 2.5 cm. Manuscripts should have this order: Title, author(s) name, affiliations, abstract, keywords, main text, acknowledgement, references. Figures and tables should be in the desired place of the main body. Tables and figures are given embedded in the manuscript and no additional files are needed. All manuscripts should contain at least Introduction, Material and Method, Results and Conclusion parts. Main text should begin with Introduction and end with Conclusion sections. Conclusion section should contain at least 300 words. The remaining sections containing Material and Method, Results (may or may not have the given titles) may be subdivided into more sections. Sections and subsections should be numbered accordingly. References should be identified by numbers in square brackets in the text and listed in numerical order at the end of the article. According to standards of included indexes, ORCID identifiers of all authors must be given. After the first round of evaluation, authors of the manuscripts having possibility of acceptance for publication are asked to revise their article according to the journal format given below. The word template is given at Template Word Document and regarding explanations are given at Explanation for Template Format. The checklist for authors is given at Check List for Authors to confirm everything is OK. The Copyright Transfer Agreement should be sent with the revised manuscript. Manuscripts should be typed in Cambria font with 9.5 pt. Manuscripts should have this order: Title, author(s) name, affiliations, abstract, keywords, main text, acknowledgement, references. All manuscripts should contain at least Introduction, Material and Method, Results and Conclusion parts. Main text should begin with Introduction and end with Conclusion sections. Conclusion section should contain at least 300 words. The remaining sections containing Material and Method, Results may or may not have the given titles and may be subdivided into more sections. Sections and subsections should be numbered accordingly. Figures and tables should be in the desired place of the main body (embedded in the text). Tables and figures are given embedded in the manuscript and no additional files are needed. The gap between the section title and paragraphs, and the gap between manuscript paragraphs should be 6 nk. There should not be any gap between the lines. The page size is B5 according to ISO standards, (17.6 cm x 25 cm). Gaps from top, right and bottom sides are all 2.1 cm and from the left side is 2.7 cm. In the first page of the manuscript title and author names should have the following format: Title should be typed in Cambria font with 12 pt. Author(s) name should be typed in Cambria font with 10 pt. Affiliations must be typed in Cambria font with 8 pt. The abstract should be as informative as possible and include a brief statement of the aim, the method and assumptions of the study, conclusions and recommendations. Presence of a concise summary of the findings at the end of the abstract is essential. Abstracts are limited to 100-250 words. Three to six words should be given which identify the scope of your study. All photographs, graphs, charts and diagrams should be referred to as figures and numbered in one consecutive sequence with Cambria numerals. The tables should be in the suggested position in the text body. Captions should include keys to symbols. All diagrams, illustrations and photographs (minimum 300 dpi at half-page size) should be in JPG format. Permission for use must be sought from the copyright owners of all illustrations, including those sourced from websites. Each table must have a title and should be numbered in order of appearance in the text. The tables should be in the suggested position in the text body and must not be given as pictures but as editable texts. The journal uses SI units wherever possible, but accepts that on some occasions other units may have to be used. Mathematical expressions should be written by an equation editor (Word format) in 9.5 point size. Indices font should have 8 point size. Each equation in text should be numbered in a consecutive format in parenthesis with section number. Symbols, formulas and equations should be written with great care, capitals and lower case letters being distinguished where necessary. Particular care should be taken in typing and in proof-reading mathematical expressions containing such characters. All symbols should be type-set in italics. Author surname first name initial(s). Title of the article.Title of the journal, year;volume(issue): page interval. Inel M, Ozmen HB. 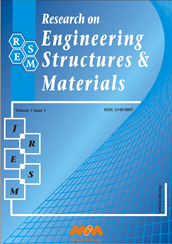 Effects of plastic hinge properties in nonlinear analysis of reinforced concrete buildings. Engineering structures. 2006;28(11):1494-502. Author surname first name initial(s). Title of the subject. Title of the book, edition number, place of print, publisher year:page interval, ISBN number. Crawford RJ. Analysis of polymer melts. Plastics Engineering, 3rd edition, London Butterworth Heinemann, 2002:343 – 346, ISBN 0 – 7506 – 3764 – 1. Author surname first name initial(s). Title of the thesis, thesis type (MSc. or Ph.D), institute submitted, place, country, page interval, year. Özmen HB. Evaluation of factors that affects seismic performance of low and mid-rise reinforced concrete buildings, PhD Thesis, Pamukkale University, Denizli, Turkey, 20-40, 2005. Author surname first name initial(s). Title of the presentation.Name of the congress, seminar or conference, place, page interval, year. Toppare L. 4-bromstrien and a-metilstirencopolimerization with electrochemical process. II. National Macromolecule Symposium, İzmir, 85 – 96, 1985. Authors will receive proofs, which they should correct (if necessary) and return as soon as possible. Note that RESM may proceed with the publication of your article, if no response is received.